While PC gamers prepare to cloister themselves away in VR experiences this spring, the first wave of augmented reality headsets is already in the thick of development. It’s about to get a huge push forward though, thanks to the Meta 2 headset, which embarrasses other options with its wealth of features and turbo-charged specs. The headset will be focused on productivity and collaboration. 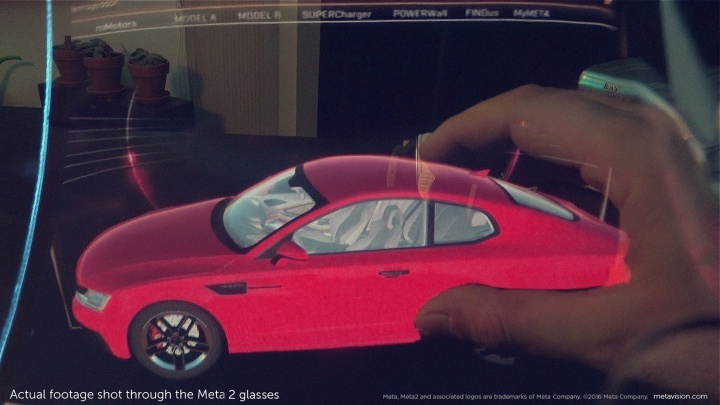 But the Meta 2 is much more impressive than other AR headsets that we’ve seen. Rather than just a small hologram area like the Hololens, the Meta 2 boasts a huge 90-degree field of view. It’s also a full-fledged 1,440p screen, thanks to a mirrored overhead display. 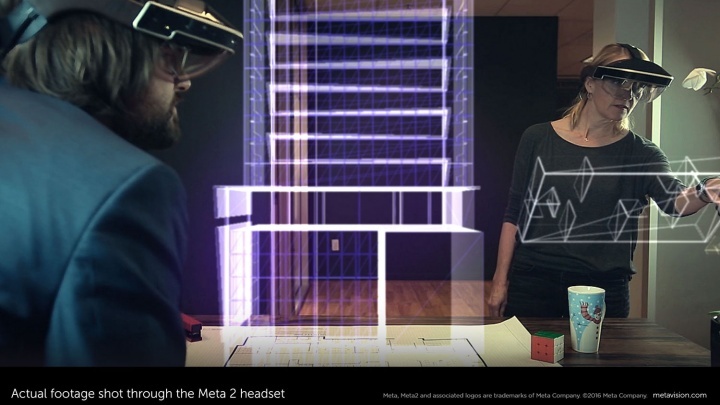 While we don’t know the specifications of the screen on the HoloLens, the Meta’s experience is almost certainly higher quality than the headset we tested back in May of 2015. There’s also a 720p webcam on the front, but the real trick is in the sensors. The sensor array in the Meta 2 handles hand and location tracking for the headset, allowing for a completely hand-controlled experience. It also means no stationary tracking fixtures, like the HTC Vive’s lighthouse. Granted, this version of the Meta is tethered to a computer via a 9-foot cable, either HDMI 1.4b or DisplayPort. Eventually the headset will be a standalone device, but like competitors, the technology isn’t quite there at an affordable price. The Meta has a relatively affordable $949 price tag, while HoloLens pre-orders cost $3,000. 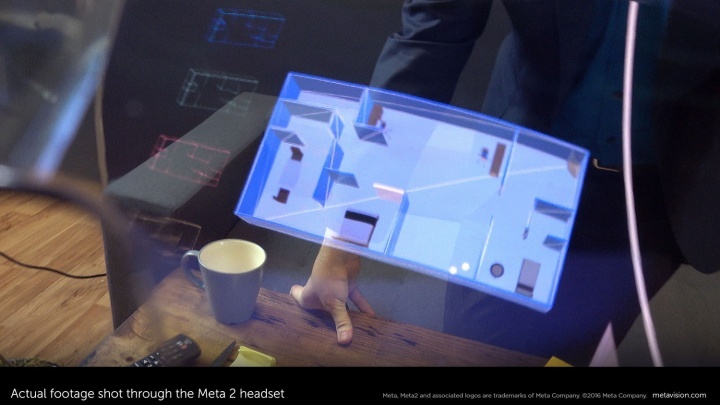 You can still interact in augmented reality space with familiar control methods like a keyboard, or a Web browser. In fact, right out of the box, the Meta 2 supports Microsoft Office, the Adobe Creative Suite, and Spotify, and it’s all built on Unity, an increasingly popular VR and AR platform. It’s worth pointing out that this version of the headset is designed specifically with developers in mind. It’s lightweight and comfortable, while still coming on and off easily for testing and coding. Ultimately, the headset will be focused on productivity and collaboration, with multiple headsets syncing up to show the same content, and allowing both users to interact with it simultaneously.